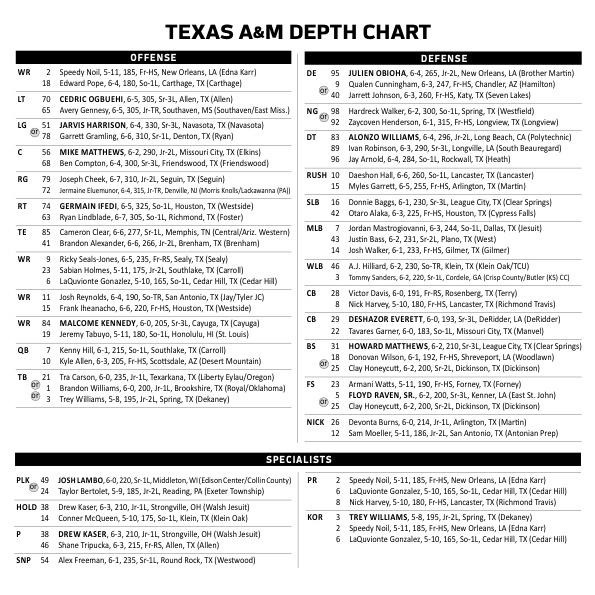 The Aggies released their depth chart for the first week and for the most part it is as expected. However, there are a few surprises of note. Most noteworthy is at safety. True freshman Armani Watts has impressed in camp and was reportedly pushing senior Floyd Raven for playing time. Well according to this release, he will start in the South Carolina game. Victor Davis will start at cornerback in replacement of injured De’Vante Harris. Harris is expected to be out for the next 4-6 weeks with a urinary tract injury. Furthermore, Shaan Washington is out for 4-6 weeks due to a broken clavicle and is not listed in the depth chart. Instead, TCU transfer A.J. Hilliard checks in as the starter with Tommy Sanders as his backup. Offensively, the starting roles are as expected. With Speedy Noil, Ricky Seals-Jones, and Malcome Kennedy locking up starting positions at the end of spring camp, a 4th receiver position was up for grabs. JUCO transfer Josh Reynolds has reportedly put on size over the offseason and has been an elite outside threat during fall camp resulting in him earning the final starting spot. The coaches have raved about all 3 running backs this fall, and by all appearances it looks like they plan to utilize all. Yesterday we began a 2 part series diving into the quarterback position at A&M. If you haven’t see yesterday’s article yet, you can read it here. The Aggies enter the 2014 season in a rather precarious situation. 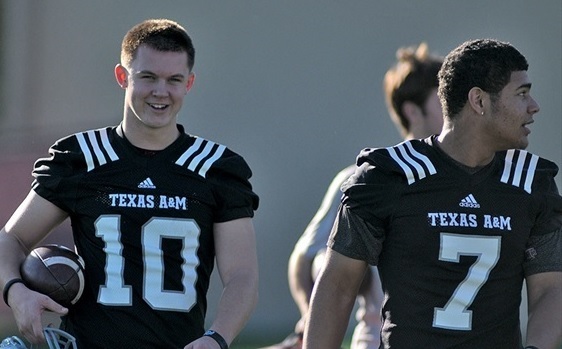 True sophomore Kenny Hill and true freshman Kyle Allen are the only scholarship quarterbacks on the roster. And while both are very talented and capable of leading the Aggies in the post-Manziel era, the lack of numbers is enough to make any coach cringe. To make matters worse, A&M plays in the vicious SEC West and tees off against two of the top defensive teams from the SEC East. Depth is crucial and Aggies need to hope that the two quarterbacks stay injury free this season.